Long distance riding - why not on quads? Discussion in 'The Perfect Line and Other Riding Myths' started by Venturello, Feb 18, 2006. Lately in my location Quads are the rage - so many people are buying them. But not for play, but for serious dirt riding (a popular trail starts near my house). Doing mountain biking nearby, I´ve seen them going through amazing stuff - not only dirt or rocks or steep slopes, but bad mud. From what I read on this site and others, long distance riders on their heavy bikes, many times big oilheads, with lots or luggage, suffer A LOT when meating with mud. Locked wheels, falls, very slow going... desperate in cases. I recall StrikingViking´s going around Borneo was terrible, but not many go there - but many suffer through south america or africa when meeting mud, a few have had bad falls. 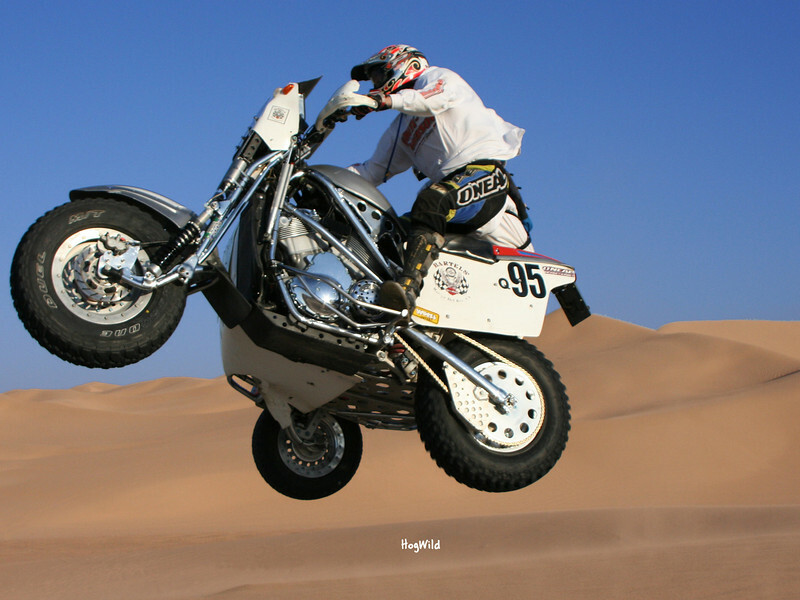 So, why not use an ATV for a long distance trip like this? Sure I would miss leaning into curves and the flexibility of cutting through traffic in a narrow bike, but in a quad you would also get that 'out there in the wind' feeling. Besides the advantage in mud, you have much lesser risk of spills (see WorldRider´s trip just ruined by a simple slow speed fall in Bolivia). Are they a much better vehicle for bad terrains? In a trip like this, wouldnt they pay off? Also, their cargo capacity would appear to be very good, having 4 big wheels. Dont know if I am commiting sacrilege by asking this question, but curious - might be I have just never read about someone using an ATV to world ride, and there are a few people doing it. Seen people doing it on Vespas, R1's, vans, big land cruisers, a beetle, but not an ATV which seems to make sense. Also would like to know your thoughts on this alternative. I've never seen a street legal ATV so thats probaly most of the problem. This is like asking a hiker if he would be content to see a National Park from a tour bus! Here in the US there is a saying in the Jeep communities... "It's a Jeep thing...You wouldn't understand." And as it's already been mentioned... ATVs aren't street legal. I've wanted to take a long ATV trip in Baja for the last couple years, but it just hasn't clicked....yet. The big ones can haul a lot of stuff like coolers and fuel. I'd like to learn how many miles you can get out of a set of tires. The info I have says that you can ride them on the street as long as you're wearing a helment...which no one does. 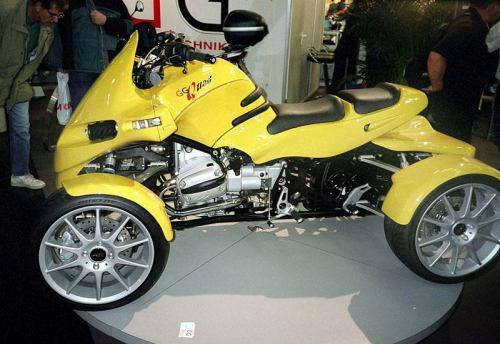 Seems to me like if you want ATV offroad advantages in a motorcycle tour worthy package you should be looking at a Sidecar hack, possibly even a powered sidecar. Aaaah... had no idea they where not street legal in the US. That´s a problem! Here in Spain IIRC they are (while they keep under a certain weight) with a large motorcycle license and helmet on. As I said, now on the weekends I see them riding through town all the time to get to the trails. Here in Spain (and I think elsewhere in Europe) there are several different kind of vehicles allowed on the road - example, the 'microcoches' or minicars, which are small cars with weight and power limitation, which require no license to operate. They cannot go into the highways and are limited to a certain max speed. But when a driver's license is difficult to get and expensive (like 700), parking space so hard to find and gas so expensive, they are more attractive than elsewhere. Also, the latest models have all the amenities (power all, air conditioning, etc). Could be, except for the fact that there isn't a nice Japanese motor in it. Tons of plated quads in AZ. There's even a plated Yamaha Raptor in Tucson with big spinner wheels. But back on subject I was wondering this myself. On my last Baja trip we saw zero quads doing the route we took. Not street legal in NY, even with a helmet. Wouldn't mind giving Alaska a go on one, though. One other thing, I have not ridden a quad yet that I felt would be comfortable cruising at legal (and who keeps it under legal) speed on the freeway even if it could be made street legal. Different tires and gearing might help with that but IIRC not many quads out there are chain drive anymore, most of the utility ones seem to be shaft and therefore not changeable as far as gearing goes. Don't get me wrong I think a quad would be a great urban commuter, say less than a 5 mile commute and no freeway but other than that not real suitable for use on the road. As far as Ouray goes, county law allows quads (and non registered bikes) on county roads(not state hiways as I understand). Must be insured IAW state law. I have seen a few here in <?xml:namespace prefix = st1 ns = "urn:schemas-microsoft-com ffice:smarttags" /><st1:City><st1 lace>Phoenix</st1 lace></st1:City> also. 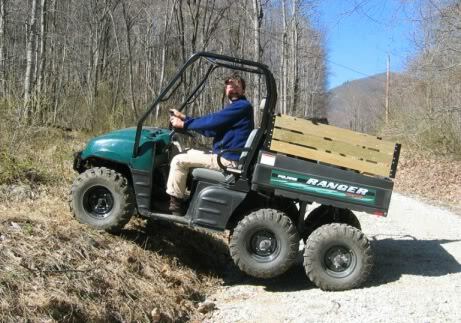 Most get them licensed so they are legal on forest roads that require a plated vehicle. My insurance agent said they insure lots of street legal quads. Most owners keep them at cabins or summer homes so they can just head out from there. Riding one on the street is quite squirrelly because of the tire flex and the solid axel in the back. Makes turning at speed tricky. If they had stiffer tires and/or a differential in the back it would be better. Tons of plated quads in AZ. There's even a plated Yamaha Raptor in Tucson with big spinner wheels. They may be fine to plate and zip around town, but I sure wouldn't want to ride one at highway speeds unless they make some serious improvements in the handling. Spent some time on a quad once. I don't think it would be fun at freeway speeds for more than a few seconds. With a different tire choice maybe. There a lots of plated quads here in Arizona. Usually supporting fundraising events. Runs about 42 mph in High. But it's needs different tires to handle better on the pavement. It also has high/low beams, rear parking lights, and rear brake lights. I've got a Farm Use tag on it, but that's not official. Lots of them in WY are plated. Another problem for long rides would be the throttle. Every one I've seen has a thumb lever like a snowmobile. there are thousands of trails in Alberta. When i go hunting the quad sees over a 1000 kms and the thumb throttle is no problem. the problem is you get about 140 kms on a 4.5 gallon tank of fuel..